Exposure to sunlight, natural aging and lifestyle factors can diminish skin's vitality. As the cell renewal cycle becomes less efficient, skin becomes rough in texture, loses its tone and is blotchy and uneven in color. 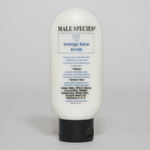 Male Species helps restore skin health and fitness at a cellular level. Powerful hydrating antioxidant formulas infused with essential marine, herbal and botanical derivatives, carefully selected for their potency in regenerating cells and promoting skin elasticity. All products are fragrance-free, animal test-free and dye-free.